Raphaella Smits was born on the 1st of February 1957. She grew up in an artistic family. Her father René Smits is a sculptor and an amateur violinist. Her mother Carolien Van Giel was a teacher in the Waldorf kindergarden and an amateur pianist. Her brother Johan Smits was a professional violinist. 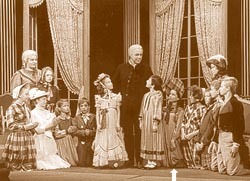 During her childhood, Raphaella enjoyed singing in a choir and participated in several productions in the Royal Flemish Opera of Antwerp. 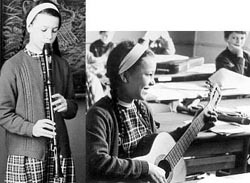 At the Waldorf school she learned to play the whole family of the recorders (the vertical flutes soprano, alto, tenor and bass). Seeing that she enjoyed singing so much, Raphaella's parents bought her a guitar to accompany herself. After a few months of simple chord strumming, however, twelve-year-old Raphaella became frustrated and asked her music teacher Ward de Beer (whose instrument was the violin), for help. "Of course. ", he responded. "Next month Andrès Segovia is giving a recital in Brussels : I shall go to observe him and I'll tell you what I have learned". Seeing the great Spanish master of the guitar, did nothing to dampen the violinist's guitaristic self-confidence. "Now I know how to do it. ", he told Raphaella upon his return. "Put your left hand here, hold your right hand like this, put your left foot on this stack of books and just play!". And play she did.